Stage IIIA lung cancer (2). Drawing shows cancer in the lymph nodes, trachea, carina, left main bronchus, esophagus, sternum, diaphragm, and major blood vessels that lead to or from the heart; there may be separate tumors in the same lung. Top inset shows cancer that has spread from the lung through the lung lining and chest wall lining into the chest wall; a rib is also shown. Bottom inset shows cancer that has spread from the lung, through the membrane around the heart, into the heart. Stage IIIA lung cancer (2). Cancer has spread to certain lymph nodes on the same side of the chest as the primary tumor. The cancer may have spread to (a) the main bronchus; (b) the lung lining, chest wall lining, or chest wall; (c) diaphragm; (d) heart and/or membrane around the it; (e) major blood vessels that lead to or from the heart; (f) trachea; (g) esophagus; (h) sternum; and/or (i) carina; and/or (j) there may be one or more separate tumors in any lobe of the same lung. Cancer may have spread to the nerves that control the diaphragm and larynx, and the whole lung may have collapsed or become inflamed (not shown). 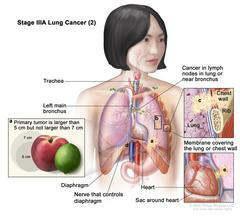 Stage IIIA lung cancer (2).